During our visit to Fornello, Brenda reminded me twice that the final day of our trip was Yom Kippur, the highest holiday in the Jewish Calendar. I wished she hadn’t mentioned it so I could have let it pass unnoticed. I woke up Thursday morning feeling guilty—in part for the privilege of enjoying Italy during the time of year I would normally be staggering under my Fall quarter workload, and more specifically at the prospect of going on our scheduled gastronomic and wine tour of the Chianti region on this fast day. I hadnt attended a synagogue service in decades, but refraining from food for 24 hours and going into the woods alone on this holiday was one religious duty I had regularly observed. 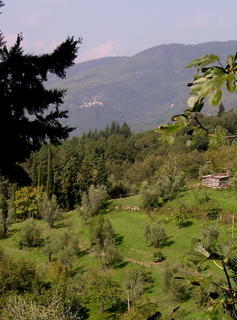 I decided to skip breakfast, excuse myself from the tour, and head for countryside. It took me a cranky uncaffeinated hour to negotiate buying a ticket from the Tabak shop and find the right bus stop, but by 11 a.m. 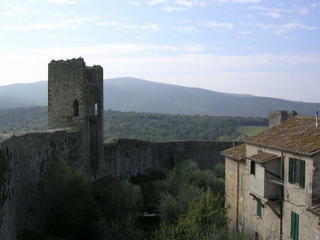 I had reached Monteriggioni, where my Italian Alpine Club map indicated the beginning of an excursion leading to the top of Monte Maggiore. I wandered through the tiny village inside the fortress, sat for a moment in the empty chapel, and left 50 cents in the offering box. I paid a Euro to the lonely young man guarding the stairway that led to the top of the wall from which I could see the mountain towering in the mist. 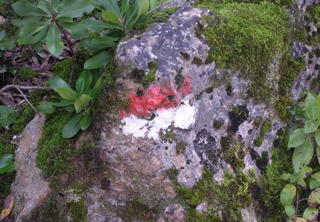 In the car park on the south side of the wall, I found a large sign with a maps and historical information about the trail ahead. Like the piazza between the Siena Duomo and the Ospedale, this too was part of the Via Francigena, the pilgrim itinerary from Compostela to Rome that put me on a venerable path of discomfort, wanderlust and spiritual aspiration. My route through the wilderness of “Montagnola” would take me to the summit and then on what a sign called “La Grande Traversata,” down to the villages of Fungaia and Santa Columba on the other side, where I could catch another bus back to the city. A dirt road led me into thick woods which occasionally opened up to fields, olive groves, and old villas and ended at an organic farm and meditation center named Ebbio, where several guests stood in the courtyard looking nervous and smoking cigarettes. Here the road gave way to a steep trail that tunnelled through forests of small trees, some thick with brush, others recently thinned and coppiced. I was serenaded by unfamiliar melodies that sounded as if they could only have been sung by birds called “larks.” Exertion and solitude and the growing distance from the valley occasionaly visible through a break in the trees contributed to the pleasant buzz in my head created by the emptiness in my stomach. A small trail branched to the left which I thought might lead to the summit. 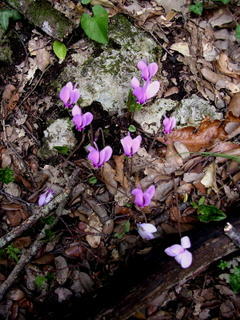 I noticed a cluster of delicate pink cyclamen growing in the deep shade at my feet, fresh blooms in mid-autumn. I followed the side trail uphill for several minutes, but rather than reaching a summit, it headed back downhill. Conscious that it was well past noon and that I hadnt seen any signs or trail markers for the last hour, I no longer could locate myself on the map with certainty. I returned to the patch of cyclamen and continued heading toward the westering sun, hoping soon to find a junction that would lead to the south and then east. The bird song had ceased and now in the distance I heard the whine of one, then two chainsaws. 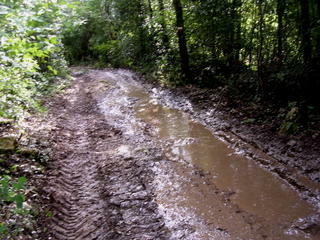 The trail came to a clearing at a junction of several tracks filled with deep mud, sign of the recent passage of skidders, the huge insect-like machines which drag timber out of the forest. Across a plateau miles ahead of me I could see land that had recently been cleared but no evidence of civilization or indications of where I could make my way out of this endless Montagnola. I walked faster and then half ran toward the ugly sounds of the chainsaws but seemed to get no closer and found new paths heading off in all directions. I felt stirrings of fear and confusion. I checked my watch and told myself that if I found no landmark within ten minutes I would have to admit defeat, turn around and retrace my steps. Twenty minutes later, with an unmistakeable taste of panic in my mouth, I did just that. The walk back was long and boring. Having neither reached the summit nor accomplished “La Grande Traversata,” once I knew my way, I took an alternative dirt road down to the valley that passed by a memorial to WW II partisans who hid in this wilderness but finally were captured and executed by the Nazis. I passed several men with guns and dogs who were out hunting, probably for larks. The road was steep, viewless and littered with trash. 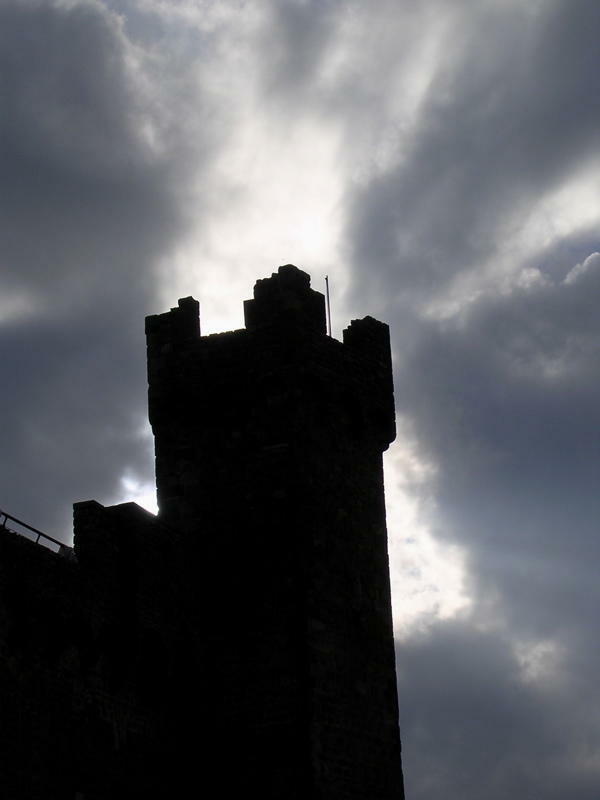 It emerged at Abbadia de Isola, which the historical signs told me was the site of an Abbey and military outpost for Siena that was rendered obsolete with the construction of Monteriggione back in the eleventh century. The buildings were standing, but restoration had not proceeded. Inside, on rutted dirt streets, I saw decrepit old people coming and going from apartments built into the decaying ruin. 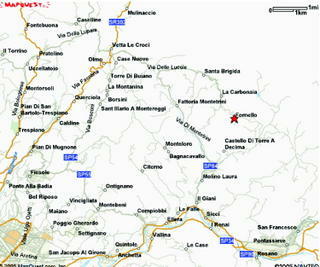 A sign on the road through the village indicated that the last bus to Siena had departed hours ago. By now footsore and fatigued as well as hungry, I trudged toward a junction with the main highway. The prosperous American Elderhosteler had no choice but to hitchhike. I stuck out my thumb—probably not even the right gesture—and for fifteen minutes got nothing but puzzled stares from occasionally passing cars. Then in the distance I saw it—the Blue Bus. As it approached I could read “Siena Direct” in little yellow lights above the windshield. I don’t think I was at a real bus stop, but in my pocket I carried the return ticket I’d purchased for 90 cents that morning at the Tabak shop, so I stood in the road, and it stopped and opened its door. Back in the city and feeling triumphant, I stepped off at the Piazza Diavoli near our hotel. I was greeted by Tom, a member of our group, who was eager to fill me in on their day’s excursion and to give me a slide show on the back of his little camera until the local bus he was waiting for pulled up and took him downtown. 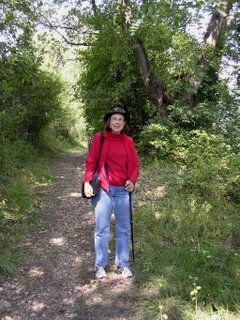 I walked through the Hotel’s entry arch and up the tree-lined promenade, a genial variation of the trail through the dark wood on Monte Maggiore. At the top, I enjoyed my last view of the towers of Siena in the waning light. Jan welcomed me with some bread and wine to break my fast. At our final meal together in the brightly lit dining room, I joined 35 Elderhostlers in toasting our caring hosts and bidding each other farewell. 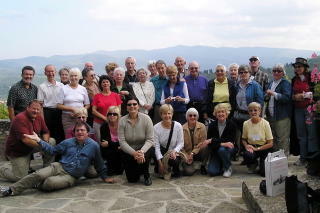 A member of our group asked Louise, our graceful guide in Cortona, whether she knew Frances Mayes, the author of Under the Tuscan Sun, the bestseller book and film story of an American woman who falls in love with Italy, buys an abandoned farmhouse and olive grove near that town and settles in for good. Louise answered, “Sort of…that is I hear about her from my plumber. He also works for her.” Until Wednesday, the next to last day of the Elder Hostel program, this was as close as we’d come to a real local resident. 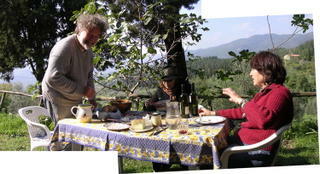 So Jan and I were excited to use our only day off to accept our old friend Brenda’s repeated invitation to visit her and her partner Don at their country home at Fornello in the hills above Florence. We knew Brenda in the late sixties when I was a probationary instructor and she and Jan were graduate students at Columbia University. The two of them were in the same Dante seminar, and we crossed paths as visitors to Florence the summer of 1969, our last time in Italy. One hot evening the three of us attended a concert in the courtyard of the Pitti Palace, and during intermission, Brenda struck up a conversation with a clarinet player in the orchestra, later married him, moved to Florence and has lived there ever since. The following year Jan and I emigrated to live at the end of the road in coastal British Columbia, where we remained for nine years. In the intervening time, we had heard a bit about Brenda through a mutual friend in California, and before this trip we reestablished contact by email. As we continued up the mountain, the views longer and more pristine, it was hard to believe that she could commute several times a week to teaching jobs in Florence and Bologna. Santa Brigida was just a few houses and a church hanging onto the mountainside along the roadway, and there we stopped in her little local market for bread, cheese, prosciutto and salad vegetables. It took a good twenty minutes before she and Jan emerged from what looked like a Romanesque stone balconied façade with some of the makings for lunch. Another couple of miles, past a large villa that used to house the noble that owned all the land in this valley, and we turned up an impossibly steep driveway, passed an assemblage of plastic playground equipment belonging to the people who owned the main house, and stopped alongside a converted brick barn set on a terrace above a sloping olive orchard. 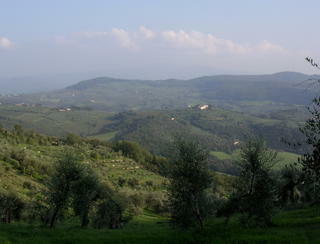 This was the landscape described in Vergil’s Eclogues. It was a familiar two thousand year old dream: the subject of my doctoral dissertation on Renaissance pastoral. Soft chestnuts, and of curdled milk enough. Like it was for Vergil’s shepherds however, so this perfection was imperilled. As age creeps up, wages and pensions are frozen and the cost of living rises–especially gas for commuters and rents for possible recreational property now on the global real estate market. 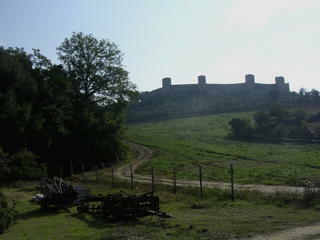 In the dark, on the way back down to the train station at Sieci, Brenda mentioned that they may soon be forced to move. 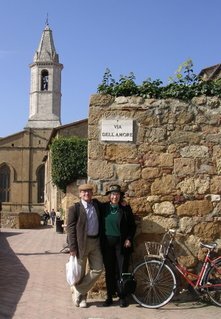 This is the word associated by our Elderhostel hosts, the Green Guide, travel websites, and real estate agents with the town of Pienza, which was on the itinerary for Tuesday October 11. In 1516, the English Humanist Sir Thomas More coined the term—stemming from eu-topia, “the good place” in Greek but also from ou-topia, or “no place”—to name an ideal city state, but also to lightly mock the notion of such an ideal. Pienza was created by our local hero with the funny name, Pope Pius Piccollomini, an Italian Humanist crowned poet-laureate and later head of the Catholic Church. 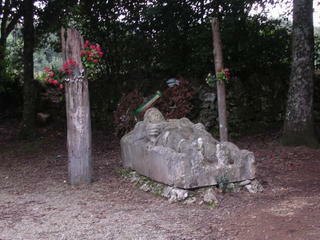 Like More, he tried unsuccessfully to bring peace and justice into a world more amenable to agression and greed. PPP dedicated some of his considerable resources to turning his sleepy home town into a showpiece of social engineering and architectural perfection with the help of a great Renaissance builder known as Rossellino. Like the other hilltowns we had visited, Pienza today is vehicle-free and immaculate. We left the bus in the car-park outside the wall and walked through floral window-box lined streets and discreetly signed shops offering specialties of the countryside into a small but indeed perfectly designed town square. It was all elegant and discreet high Renaissance style, which by now I was clearly differentiating from the cruder medieval and crasser Baroque forms. 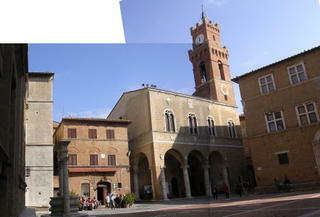 The city hall to the left, housing a tourist information center, was an airy miniature of Siena’s. Before us was the Duomo’s chaste but lucious travertine facade, backlit by the sun shining on the valley below. 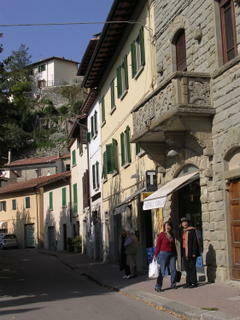 To the right stood an unostentatious but imposing structure recalling the Villa Antenori that had lured me in Florence. This was the Piccollomini Palace, through which we were conducted by a local guide whose Italian-accented English was even thicker and more savory than that of our native Elderhostel facilitators. The place was inhabited by PPP’s descendants until 1968 and then maintained in the condition they left it—sparely furnished with centuries-old portraits and tapestries accentuating 20 foot ceilings, wall frescoes, and the light pouring in through large stained glass windows ornamented with the family coat of arms signifying either accommodation between the cross and the crescent or the triumph of the latter over the former. Also in evidence were 20th century photographs showcasing the blood connections between this family and the royal Italian house of Bourbon along with the heroic expoits of pilots in Mussolini’s air force. Out on the three story loggia we learned that the lovely though too misty view of the formal gardens and Val D’Orcia below was itself a UNESCO world heritage site. Jan and I roamed slowly through the village, trading photo-ops with another couple under the street sign placed here to promote tourism in the nineteenth century, joining those window shopping for real estate, and buying Pinocchio puppets for our grandsons and some typical Tuscan ceramics I have faith were not produced in China. After lunch the bus wound through the painterly countryside of La Crete and left us off in nearby Montalcino, home of the legendary Brunello, allegedly the crème de la crème of Italian wines. Seeking some exercise and adventure trekking through the steep streets of this larger town, we found ourselves suddenly marooned at the bottom of the hill, far from any restroom. The relief provided by facilities in the Enoteca we finally came upon eclipsed the pleasure of drinking a seven dollar glass of the house specialty. Monday morning reunited us for the last time with Donatella, again in the piazza in front of the Duomo. There was no preparatory lecture for this excursion, and the façade of the building we entered –the Ospedale or Museum of the former Hospital of Santa Maria della Scala–was unimpressive, so the significance of the place took a while to dawn on me and has continued to grow until today, when I discovered a wonderful new website about it still under construction. 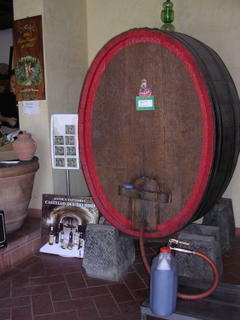 Like Santa Maria Novella in Florence, this is a place I’d like to revisit equipped with more knowledge. Donatella told us that the unimposing building we had entered was actually much larger than the Duomo, and at a volume of 350 million cubic meters, I suspect it’s larger even than the abandoned Superduomo project. Some of its size became apparent after we descended from the large chapel and entry chambers on the ground floor to the levels below, each of which seemed to extend deeper and wider through labyrinthine vaults and arched chambers. Nowhere was there daylight, but vertical and horizontal shafts opened at every turn to what looked like an infinite regress of excavation and renovation. Only when I discovered this image of the rear view of the complex on the website did I have any sense of how such a building could ever have been constructed. Until a few years ago when its functions were moved to a new location, Ospedale was in continous operation for ten centuries as a City Hospital and Welfare center–according to the Sienese the first such institution in Europe. Today it houses a cultural complex including restored chapels and antique medical facilities, a display of the original sculptures decorating the fountain in the Campo (including Jacopo Della Quercia’s exquisite statue of the Virgin Mary), an archeological museum and ongoing archaelogical dig, a film museum, and a conference center, which during our visit was hosting an international convocation on Fair Trade. Donatella ended the tour back up on the ground floor in the Sala del Pellegrinaio, or Hall of Pilgrimage, the intake wing of the ancient hospital where both residents of Siena and millions of pilgrims who fell ill on their journeys were tended by medical staff supported by the city and an independent foundation funded by The Bank and private bequests from those who had been helped. 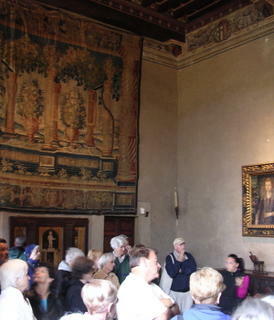 The walls of this great hall had originally been covered by frescoes on religious subjects, but in the fifteenth century they were replaced by an amazing sequence by Vecchietta and Domenico di Bartolo depicting the suffering of patients and the healing efforts of hospital staff and administration. The connections between the intrepid and the frail, between Hostel and Hospital, travel and pilgrimage, life and journey kept growing in my mind. Frequent signage around Tuscany linked our route with Canterbury England where Chaucer’s fourteenth century company of pilgrims ended their voyage to the shrine of Thomas a Becket, “the holy blissful martyr for to seek/ That them had helped when that they were sick.” For this aging vulnerable traveller and client of present-day “health care delivery systems,” it was not hard to imagine the solace that the frescoes would offer both poor and wealthy entrants to this building. Discharged from the Ospedale, we planned to test Jan’s sore knee and my irritated lungs with another attempt at hiking out of the city and up the neighboring hill of L’osservatoria. We bought procsciutto and pecorino at a deli and followed a winding street through the wall below the towering cathedral of St. Francis. At a traffic intersection I noticed a pool of crystal clear water covered by vaulted arches in a green gully below us. 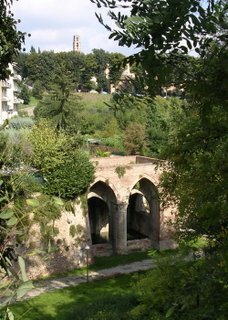 We descended to this unnamed fountain–which we later we learned was a medieval laundromat– and ate lunch at its edge before continuing across railroad tracks and freeway to a footpath heading up the forested ridge opposite the city. After encountering chickens in an olive grove and a girl chasing butterflies, we found the old monastery and school for children adjoining a church that had been destroyed by bombs during WWII and later reconstructed. An acolyte told us where we could catch a bus back to the city, and at the stop we met the butterfly girl again, who turned out to be a grad student in lepidopterology. The bus made a circle tour of the suburbs, stopping en route at a huge hospital complex that I realized was the one monstrosity that marred the perfect landscape I had admired from the City Hall Tower. Jan pointed out that this must be where the Ospedale had been relocated and mentioned she had read that Siena is known today for its excellent healthcare and medical research facillities. At 5:00 a.m. on the morning of our departure a few days later, she got into a conversation with two jetlagged young men who had just arrived to work at that hospital on a vaccine against the avian flu currently threatening a world-wide pandemic. 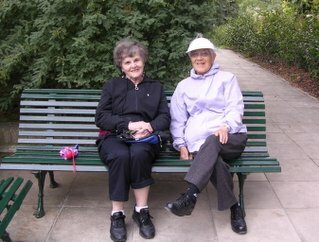 Our day’s pere- grinations concluded at the top of the grand allee in the Hotel Garden where we found our amiable table companions, Sydell and Aeko, sitting contentedly on a bench waiting for dinner. Sydell is from New York City and once taught math at the same school where Jan taught English. Aeko is from Berkeley. Twenty years our seniors, they met long ago at an Elderhostel and since then often travel together in exotic places. You are currently browsing the archives for October, 2005.